Grip one of the handles in the interior trim of the tailgate (arrows). Pull the tailgate down with some force until it engages in the lock. Pull the tailgate to ensure that it is engaged securely. The vehicle will lock again automatically after approximately 120 seconds if you do not open one of the doors or the tailgate. This function prevents the vehicle from remaining unlocked if the unlocking button is pressed by mistake. 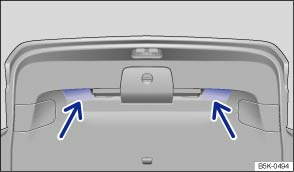 The tailgate can only be locked when it is properly closed and engaged. The tailgate is also locked by the central locking system. If the tailgate of a locked vehicle is unlocked using the button on the vehicle key, it will lock again a few seconds after it is closed. The anti-theft alarm is activated immediately after it is closed . If the tailgate is closed but not locked, it will lock automatically once the vehicle reaches a speed of approximately 9 km/h (6 mph). Serious injuries can occur if the tailgate is closed incorrectly or without due care and attention. Never leave children playing unattended in or around the vehicle, especially when the tailgate is open. Children could climb into the luggage compartment and shut the tailgate, thereby trapping themselves inside. Temperatures inside a locked vehicle may reach extremes of heat or cold, according to season. This could cause serious injuries or illness, or even have fatal consequences. Before closing the tailgate, check that the vehicle key is not in the luggage compartment.